Members of Mexico's Gulf Cartel are shown to the press after being detained in Tamaulipas State on Tuesday. 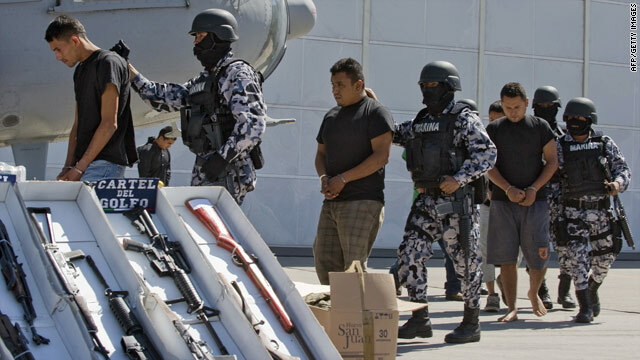 Mexico City, Mexico (CNN) -- Mexico's navy on Wednesday announced the arrests of 30 members of the Gulf drug cartel following several armed confrontations in the northern state of Tamaulipas. At least one marine and eight cartel members were killed in the firefights, navy spokesman Jose Luis Vergara said, according to the state-run Notimex news agency. The operations against the cartel were based on information from the navy's intelligence apparatus and the national intelligence agency, Vergara said. Authorities seized 43 assault rifles, 10 handguns, two rocket launchers, a rocket and 21 hand grenades from the cartel operatives. They also recovered 10 helmets and six bulletproof vests. The cartel members were holding 588,000 pesos ($47,000) and $393,343 in American currency, Vergara said. Those arrested were involved in drug trafficking, extortion and kidnapping, he said. The suspects were transported to Mexico City to be questioned further by authorities. The Gulf cartel is one of Mexico's major drug-trafficking organizations, based In the city of Matamoros, across the border from Brownsville, Texas. The cartel is currently in a turf battle in the region with its former enforcers-turned-rivals, the Zetas cartel.